Who doesn’t want to eat cookies for breakfast? These breakfast cookies are filled with superfoods and fiber that will help keep you full. Oats are filled with fiber and vitamins. It’s no wonder oatmeal is the perfect way to start your morning off right. The carbs in oatmeal help you feel focused and give you the energy to keep going. Fiber is a great way to keep you feeling full. These breakfast cookies are a great way to start off your day. Flaxseeds have heart-healthy omega-3’s as well as fiber. You can add flaxseeds to a ton of different recipes for an extra healthy boost. Pumpkin is another superfood! Not many people know that they’re loaded with fiber, antioxidants, and disease-fighting vitamins. Plus, it tastes great! If you love the flavors of Fall, you’ll love these pumpkin-filled cookies. You can make this batch of breakfast cookies over the weekend and keep them for the whole week. When you’re running around in the morning and don’t know what to eat, grab a couple of these cookies and go! Breakfast cookies are an easy make-ahead breakfast for every day of the week. 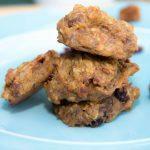 Check out these superfood filled cookies with pumpkin and flaxseed! Preheat oven to 350 degrees F and prepare your baking sheet with a silicon mat or parchment paper. In a large bowl, mash your bananas well until there are little to no clumps left. Add the eggs and coconut oil and give it a stir so it's well incorporated. Next, add the oats, raisins, pumpkin seeds, ground flax, the pumpkin pie spice, and salt. Give it a good mix. Use a 1/4 cup and scoop onto your baking sheet. You can flatten them a bit since they won't really spread out when they 're baked. Bake for 15-20 minutes until the edges start to look a little but browned. Let the cookies cool on the baking sheet and serve. For breakfast, 2-3 should be a good amount. As a snack, aim for one. This recipe should make about 12 cookies if you use the 1/4 measuring cup. If you choose to make smaller cookies, you might have a larger batch.